IBM manufactured magnetic disk storage devices from 1956 to 2003, when it sold its hard disk drive business to Hitachi. Both the hard disk drive (HDD) and floppy disk drive (FDD) were invented by IBM and as such IBM's employees were responsible for many of the innovations in these products and their technologies. The basic mechanical arrangement of hard disk drives has not changed since the IBM 1301. Disk drive performance and characteristics are measured by the same standards now as they were in the 1950s. Few products in history have enjoyed such spectacular declines in cost and size along with equally dramatic improvements in capacity and performance. IBM manufactured 8-inch floppy disk drives from 1969 until the mid-1980s, but did not become a significant manufacturer of smaller-sized, 5.25- or 3.5-inch floppy disk drives (the dimension refers to the diameter of the floppy disk, not the size of the drive). IBM always offered its magnetic disk drives for sale but did not offer them with original equipment manufacturer (OEM) terms until 1981. By 1996, IBM had stopped making hard disk drives unique to its systems and was offering all its HDDs as an original equipment manufacturer (OEM). IBM uses many terms to describe its various magnetic disk drives, such as direct access storage device,[a] disk file and diskette file. Here, the current industry standard terms, hard disk drive and floppy disk drive, are used. The IBM 350 disk storage unit, the first disk drive, was announced by IBM as a component of the IBM 305 RAMAC computer system on September 14, 1956. Simultaneously a very similar product, the IBM 355, was announced for the IBM 650 RAMAC computer system. RAMAC stood for "Random Access Method of Accounting and Control." The first engineering prototype 350 disk storage shipped to Zellerbach Paper Company, San Francisco, in June 1956, with production shipment beginning in November 1957 with the shipment of a unit to United Airlines in Denver, Colorado. Its design was motivated by the need for real time accounting in business. The 350 stores 5 million 6-bit characters (3.75 MB). It has fifty 24-inch (610 mm) diameter disks with 100 recording surfaces. Each surface has 100 tracks. The disks spin at 1200 rpm. Data transfer rate is 8,800 characters per second. An access mechanism moves a pair of heads up and down to select a disk pair (one down surface and one up surface) and in and out to select a recording track of a surface pair. Several improved models were added in the 1950s. The IBM RAMAC 305 system with 350 disk storage leased for $3,200 per month. The 350 was officially withdrawn in 1969. U.S. Patent 3,503,060 from the RAMAC program is generally considered to be the fundamental patent for disk drives. This first-ever disk drive was initially cancelled by the IBM Board of Directors because of its threat to the IBM punch card business but the IBM San Jose laboratory continued development until the project was approved by IBM's president. The 350's cabinet is 60 inches (152 cm) long, 68 inches (172 cm) high and 29 inches (74 cm) wide. The RAMAC unit weighs about one ton, has to be moved around with forklifts, and was frequently transported via large cargo airplanes. According to Currie Munce, research vice president for Hitachi Global Storage Technologies (which acquired IBM's storage business), the storage capacity of the drive could have been increased beyond five million characters, but IBM's marketing department at that time was against a larger capacity drive, because they didn't know how to sell a product with more storage. Nonetheless, double capacity versions of the 350 were announced in January 1959 and shipped later the same year. In 1984, the RAMAC 350 Disk File was designated an International Historic Landmark by The American Society of Mechanical Engineers. 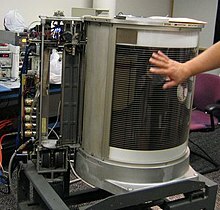 In 2002, the Magnetic Disk Heritage Center began restoration of an IBM 350 RAMAC in collaboration with Santa Clara University. In 2005, the RAMAC restoration project relocated to the Computer History Museum in Mountain View, California and is now demonstrated to the public in the museum's Revolution exhibition. The IBM 353, used on the IBM 7030, was similar to the IBM 1301, but with a faster transfer rate. It has a capacity of 2,097,152 (221) 64-bit words or 134,217,728 (227) bits and transferred 125,000 words per second. A prototype unit shipped in late 1960 was the first disk drive to use one head per surface flying on a layer of compressed air as in the older head design of the IBM 350 disk storage (RAMAC). Production 353s used self-flying heads essentially the same as those of the 1301. The IBM 355 was announced on September 14, 1956 as an addition to the popular IBM 650. It used the mechanism of the IBM 350 with three access arms[b] and stored 6 million decimal digits. Data was transferred to and from the IBM 653 magnetic core memory, an IBM 650 option that stored just sixty 10-digit words, enough for a single sector of disk or tape data. The IBM 1405 Disk Storage Unit was announced in 1961 and was designed for use with the IBM 1400 series, medium scale business computers. The 1405 Model 1 has a storage capacity of 10 million alphanumeric characters (60,000,000 bits) on 25 disks. Model 2 has a storage capacity of 20 million alphanumeric characters (120,000,000 bits) on 50 disks. In both models the disks were stacked vertically on a shaft rotating at 1200 rpm. Each side of each disk has 200 tracks divided into 5 sectors. Sectors 0-4 were on the top surface and 5-9 were on the bottom surface. Each sector held either 178 or 200 characters. One to three forked-shaped access arms each contained two read-write heads, one for the top of the disk and the other for the bottom of the same disk. The access arms were mounted on a carriage alongside the disk array. During a seek operation an access arm moved, under electronic control, vertically to seek a disk 00-49 and then horizontally to seek a track 00-199. Ten sectors were available at each track. it took about 10 ms to read or write a sector. The access time ranges from 100ms to a maximum access time for model 2 of 800ms and 700ms for model 1. The 1405 model 2 disk storage unit has 100,000 sectors containing either 200 characters in Move Mode or 178 characters in Load Mode, which adds a Word Mark bit to each character. The Model 1 contained 50,000 Sectors. The IBM 1301 Disk Storage Unit was announced on June 2, 1961. It was designed for use with the IBM 7000 series mainframe computers and the IBM 1410. The 1301 stored 28 million characters (168,000,000 bits) on a single module (25 million characters with the 1410). Each module has 20 large disks and 40 recording surfaces, with 250 tracks per surface. The 1301 Model 1 has one module, the Model 2 has two modules, stacked vertically. The disks spun at 1800 rpm. Data was transferred at 90,000 characters per second. A major advance over the IBM 350 and IBM 1405 was the use of a separate arm and head for each recording surface, with all the arms moving in and out together like a big comb. This eliminated the time needed for the arm to pull the head out of one disk and move up or down to a new disk. Seeking the desired track is also faster since, with the new design, the head will usually be somewhere in the middle of the disk, not starting on the outer edge. Maximum access time was reduced to 180 milliseconds. The 1301 is the first disk drive to use heads that are aerodynamically designed to fly over the surface of the disk on a thin layer of air. This allows them to be much closer to the recording surface, which greatly improves performance. The 1301 connects to the computer via the IBM 7631 File Control. Different models of the 7631 allow the 1301 to be used with a 1410 or 7000 series computer or shared between a 7000 and a 1410 or between two 7000's. The IBM 1301 Model 1 leased for $2,100 per month or could be purchased for $115,500. Prices for the Model 2 were $3,500 per month or $185,000 to purchase. The IBM 7631 controller cost an additional $1,185 per month or $56,000 to purchase. All models were withdrawn in 1970. The IBM 1302 Disk Storage Unit was introduced in September 1963. Improved recording quadrupled its capacity over that of the 1301, to 117 million 6-bit characters per module. Average access time is 165 ms and data can be transferred at 180 K characters/second, more than double the speed of the 1301. A second arm accesses a separate group of 250 tracks. As with the 1301, there is a Model 2 with twice the capacity. The IBM 1302 Model 1 leased for $5,600 per month or could be purchased for $252,000. Prices for the Model 2 were $7,900 per month or $355,500 to purchase. The IBM 7631 controller cost an additional $1,185 per month or $56,000 to purchase. The 1302 was withdrawn in February 1965. The IBM 1311 Disk Storage Drive was announced on October 11, 1962 and was designed for use with several medium-scale business and scientific computers. The 1311 was about the size and shape of a top-loading washing machine and stored 2 million characters (12,000,000 bits) on a removable IBM 1316 disk pack. Seven models of the 1311 were introduced during the 1960s. They were withdrawn during the early 1970s. Each IBM 1316 Disk Pack is 4 inches (100 mm) high, weighs 10 pounds (4.5 kg) and contains six 14-inch (360 mm) diameter disks, yielding 10 recording surfaces (the outer surfaces are not used). The 10 individual read/write heads are mounted on a common actuator within the disk drive which moves in and out hydraulically and mechanically detented at the desired track before reading or writing occurred. The disks spin at 1500 rpm. Each recording surface has 100 tracks with 20 sectors per track. Each sector stores 100 characters. The disk pack is covered with a clear plastic shell and a bottom cover when not in use. A lifting handle in the top center of the cover is rotated to release the bottom cover. Then the top of the 1311 drive is opened and the plastic shell lowered into the disk-drive opening (assuming it is empty). The handle is turned again to lock the disks in place and release the plastic shell, which is then removed and the drive cover closed. The process is reversed to remove a disk pack. The same methods are used for many later disk packs. Has to be drive 1 on an IBM 1440, IBM 1460, or IBM 1240 system. Contained the controller and could control up to four Model 2 drives. Introduced October 11, 1962. Withdrawn February 8, 1971. Slave drive. Could have any special feature incorporated that the master drive (drive 1) has incorporated. Introduced October 11, 1962. Withdrawn January 6, 1975. Has to be drive 1 on an IBM 1620 or IBM 1710 system. Contains the controller and can control up to three Model 2 drives. Does not support any special features. Introduced October 11, 1962. Withdrawn May 12, 1971. Has to be drive 1 on an IBM 1401 system. Contains the controller and can control up to four Model 2 drives. Introduced October 11, 1962. Withdrawn February 8, 1971. Has to be drive 1 on an IBM 1410, IBM 7010, or IBM 7740 system. Contained the controller and could control up to four Model 2 drives. Direct Seek came as standard on this model. Introduced January 7, 1963. Withdrawn May 12, 1971. No information available, probably a master drive (drive 1). Introduced March 5, 1968. Withdrawn February 2, 1971. Direct Seek: Without this option every seek returned to track zero first. Scan Disk: Automatic rapid search for identifier or condition. Seek Overlap: Allows a seek to overlap ONE read or write and any number of other seeks. Track Record: Increases the capacity of the disk by writing ONE large record per track instead of using sectors. Drive 1 (the master drive: models 1, 3, 4, and 5) was about a foot wider than the other drives (the slave drives: model 2), to contain extra power supplies and the control logic. The IBM 2302 was the System/360 version of the 1302, with track formatting in accordance with S/360 DASD architecture rather than 7000 series architecture. It attaches to IBM mainframes via a 2841 Storage Control Unit. The IBM 2305 fixed head storage (a fixed-head disk drive sometimes incorrectly called a drum) and associated IBM 2835 Storage Control were announced in 1970, initially to connect to the 360/85 and 360/195 using the IBM 2880 Block Multiplexor Channel. The 2305 Drive was in much demand when the System 370 offered Virtual Storage, and these 2305s were often used for paging devices. They were used in this way on 3155/65, 3158/68, 3033, 4341, and 3081 (with special feature microcode.) The 2305 was also used for high activity small data sets such as catalogs and job queues. The 2305-1 runs at 3.0 MB/second when attached using the 2-byte channel interface, and the larger 2305-2 runs at 1.5 MB/second. The 2305 provides large-scale IBM computers with fast, continuous access to small-sized quantities of information. Its capacity and high data rate make it ideal for some systems residence functions, work files, job queues, indices and data sets that are used repeatedly. Its fast response time make it attractive as a paging device in a heavily loaded systems (where there are 1.5 or more transactions per second). The IBM 2311 Disk Storage Drive was introduced with the 2841 Control Unit in 1964 for use throughout the IBM System/360; the combination was also available on the IBM 1130 and the IBM 1800. The drive also directly attaches to the IBM System/360 Model 20. All drives used the IBM 1316 Disk Pack introduced with the IBM 1311. The 2311 Model 1 attaches to an IBM mainframe through a 2841 Control Unit with its disk packs written with IBM's Count Key Data variable record length format. The 2311 models 11 or 12 are used when directly attached to an integrated control of the System/360 Model 20 and the disk packs are written with a fixed sector format. The disk packs are not interchangeable between those written on the Model 1 and those written on the Models 11 or 12. The 2311 mechanism is largely identical to the 1311, but recording improvements allow higher data density. The 2311 stores 7.25 megabytes on a single removable IBM 1316 disk pack (the same type used on the IBM 1311) consisting of six platters that rotate as a single unit. The 2311 has ten individual read/write (R/W) heads mounted on a common actuator which moves in and out hydraulically and is mechanically detented at the desired track before reading or writing occurred. Each recording surface has 200 tracks plus three optional tracks which could be used as alternatives in case faulty tracks were discovered. Average seek time was 85 ms. Data transfer rate was 156 kB/s. Because the 2311 was to be used with a wide variety of computers within the 360 product line, its electrical interconnection was standardized. This created an opportunity for other manufacturers to sell plug compatible disk drives for use with IBM computers and an entire industry was born. The IBM 2314 Disk Access Storage Facility was introduced on April 22, 1965, one year after the System/360 introduction. It was used with the System/360 and the System/370 lines. With the Two Channel Switch feature it could interface with two 360/370 channels. The 2314 Disk access mechanism was similar to the 2311, but further recording improvements allowed higher data density. The 2314 stored 29,176,000 characters (200×20×7294 bytes per track) on a single removable IBM 2316 disk pack which was similar in design to the 1316 but was taller as a result of increasing the number of disks from six to eleven. The 2316 disk pack containing the eleven 14-inch (360 mm) diameter disks yielded 20 recording surfaces. The drive access consisted of 20 individual R/W heads mounted on a common actuator which was moved in and out hydraulically and mechanically detented at the desired track before reading or writing occurred. Each recording surface has 200 tracks. Access time was initially the same as the 2311, but later models were faster as a result of improvements made in the hydraulic actuator. Data transfer rate was doubled to 310 kB/s. The original Model 1 consists of the 2314 control unit, a 2312 single drive module, and two 2313 four drive modules for a total of nine disk drives bundled together with one price. The drives are mounted in individual drawers that are unlatched and pulled out to access the disk pack. Because of their appearance they acquired the nickname of "Pizza Ovens". Only eight drives of the nine are available to the computer at any one time. The ninth drive is there for a spare for the user and can also be worked on "offline" by a Field Engineer while the other drives are in use by the customer. Each drive's system address is determined in part by a user-swappable plug, one such plug denoting a spare drive not system accessible. This permits physically changing the address of a drive by changing the plug. A 2844 Control Unit can be added to the 2314 Control Unit which allows two S/360 Channels simultaneous access to two separate disk drives in the Storage Facility. A 2318 two drive module was announced as part of unbundling the original product allowing attachment of one to nine drives to an unbundled 2314 Model A Storage Control Unit. 2319 B series of three disk drives modules allow three, six or nine drive attachment to a new 2314 Model B Storage Control Unit. IBM introduced the IBM 3310 Direct Access Storage Device on January 30, 1979 for IBM 4331 midrange computers. Each drive has a capacity of 64.5MB. The 3310 was a fixed block architecture device, used on DOS/VSE and VM, the only S/370 operating systems that supports FBA devices. The IBM 3330 Direct Access Storage Facility, code-named Merlin, was introduced in June 1970 for use with the IBM System/370 and the IBM System 360/195. Its removable disk packs hold 100 MB (404×19×13,030 bytes) (the 1973 Model 11 featured IBM 3336-11 Disk Packs that hold 200 MB (808x19x13,030 bytes)). Access time is 30 ms and data transfers at 806 kB/s. A major advance introduced with the 3330 is the use of error correction, which makes the drives more reliable and reduced costs because small imperfections in the disk surface can be tolerated. The circuitry can correct error bursts up to 11 bits long through use of Fire codes. The 3333-1 and the 3333-11 contain two 3330 type drives and a controller that attach to a director type storage control Up to three additional 3330 type DASD (six drives) can then be attached to a 3333. The 3330 was withdrawn in 1983. The IBM 3340 Direct Access Storage Facility, code-named Winchester, was introduced in March 1973 for use with IBM System/370. Three models were announced, the 3340-A2 with two drives and a controller, the models B2 (two drives) and B1 (one drive). B-units can connect to the model A2 to a maximum of eight drives. It uses removable data modules that included the head and arm assembly; an access door of the data module opens or closes during a mechanical load/unload process to connect the data module to the drive; unlike previous disk packs and cartridges there is no cover to remove during the insertion process. Access time is 25 millisecond and data transfers at 885 kB/s. Three versions of the removable IBM 3348 Data Module were sold, one with 35 megabyte capacity, another with 70 megabytes, the third also has 70 megabytes, of which 500 kilobytes were accessible with fixed heads for faster access. The 3340 also uses error correction. It was withdrawn in 1984. The 3340 was developed in San Jose under the leadership of Ken Haughton. Early on the design was focused on two removable 30 megabyte modules. Because of this 30/30 configuration, the code name Winchester was selected after the famous Winchester .30-30 rifle; subsequently the capacities were increased, but the code name stuck. The most significant aspect of this product, and the reason that disk drives in general became known as "Winchester technology", was that this was IBM's first drive to not unload the heads from the media. The Winchester technology allowed the head to land and take off from the disk media as the disk spun up and down. This resulted in very significant savings and a large reduction of complexity of the head and arm actuating mechanism. This rapidly became a standard design within the disk manufacturing community. The term Winchester or Winnie was used for hard disk drives in general for some time after the introduction of the 3340, but is no longer in common use in most parts of the world. The IBM 3350 Direct Access Storage Facility, code-named Madrid, was introduced in 1975 for use with IBM System/370. Its non-removable head-disk assemblies (HDAs) are sealed and included the head and arm assembly. The 3350 disk geometry is 555 cylinders, 30 heads, and 19,069 bytes per track, which give each HDA a storage capacity of 317,498,850 bytes. Sealed HDAs were standard practice on all IBM DASD hereafter. Disk units are identified as Models A2, A2F, B2, B2F, C2, and C2F with each model containing two HDAs. The models are installed in strings of units with an A2 or A2F unit required and attached to a storage control such as the IBM 3830 Model 2 or the equivalent integrated storage control of a system unit. After the A2 can be up to 3 B2 units or up to 2 B2s and a C2. The C2 unit also connects to a storage control and serves as a secondary path to itself and the A2 and B2 units. When using a C2 two I/O operations could simultaneously take place on the string, one via an A2 and a second via the C2. The valid 3350 strings are: -A, -AB, -ABB, -ABBB, -AC-, -ABC-, or -ABBC- configurations. The "x2F", as in Model A2F, unit is a normal x2 unit, but its two HDAs also have a Fixed Head area over the first five cylinders, thereby reducing[c] seek time to zero for these five cylinders. This fixed head area is intended to be allocated to the frequently accessed HASP or JES2 checkpoint area and thus greatly reduce head motion on the SPOOL device. The fixed head area can also be utilized for TSO swap data (MVT and SVS) and system swap data (MVS) wherein the swap data for SVS and MVS consist of blocks of pages that have been in memory when an address space is selected for swap-out; those pages need not be contiguous and in general do not include pages that have not been modified since their last page-in. This system architecture greatly improves context switches between TSO users or batch regions. The IBM 3350 family was withdrawn in September 1994. IBM introduced the IBM 3370 Direct Access Storage Device in January 1979 for IBM 4331, 4341, and System/38 midrange computers. It has seven fixed 14-inch (360 mm) disks, and each unit has a capacity of 571 MB. It was the first HDD to use thin film head technology; research on that technology started at Thomas J. Watson Research Center in the late 1960s. The 3370 was a fixed block architecture device, used on DOS/VSE and VM, the only S/370 operating systems that supported FBA devices. The sister unit was called the 3375 and used count key data architecture, which was required for OS/360 and successor OSes. The IBM 3380 Direct Access Storage Device was introduced in June 1980. It uses film head technology and has a unit capacity of 2.52 gigabytes (two hard disk assemblies each with two independent actuators each accessing 630 MB within one chassis) with a data transfer rate of 3 megabytes per second. Average access time was 16 ms. Purchase price at time of introduction ranged from $81,000 to $142,200. Due to tribology problems encountered between heads and media, the first units did not ship until October, 1981. In February 1985 IBM announced a double density version - the Extended Capability Models of the 3380 (3380 E) having 5.04 gigabytes per chassis, that is, two 1.26 gigabyte actuators on two hard disk assemblies in one chassis. A triple capacity version, the 3380 K was announced in August 1987 having 7.562 gigabytes per chassis, that is, two 1.89 gigabyte actuators on two hard disk assemblies in one chassis. There are twelve models of the IBM 3380 family: six A-units, five B-units and one C-unit. A-units (heads of string) contain additional logic to perform string controller functions and connect to IBM directors or equivalent integrated attachments. The C-units connect to an IBM channel rather than a director. B-units connected to A-units or C-units. A string of 3380s with 16 actuators could provide from 10.08 gigabytes to 60.5 gigabytes, depending on model configuration. The IBM 3390 Direct Access Storage Device series was introduced November 1989, offering a maximum storage of up to 22 gigabytes in a string of multiple drives. Cost of a storage system varied by configuration and capacity, between $90,000 and $795,000. Packaged in Hard Disk Assemblies with 2 actuator-head units and one set of platters, a model 1 HDA provides 1.89 GB before formatting and a model 2 provides 3.78 GB/HDA. The Model 3 enhancement to the drive family, announced September 11, 1991, increased capacity 1.5 times to 5.67 GB/HDA and the Model 9, announced May 20, 1993, further increased capacity 3 times to 11.3 GB/HDA, totaling 34 GB in a single cabinet, or 544 GB per storage subsystem. The 3390 Model 9 was the last Single Large Expensive Disk (sometimes called SLEDs) drive announced by IBM. The 9345 HDD first shipped in Nov 1990 as an RPQ on IBMs SCSE (SuperComputing Systems Extensions). Developed at IBM's San Jose, California laboratory under the code name Sawmill. It was an up to 1.5 GB full height 5¼-inch HDD using up to 8 130 mm disks. It was the first HDD to use MR (Magneto Resistive) heads. In October 1991 the 9345 DASD was announced as part of the IBM 9340 channel-attached, count key data (CKD) DASD subsystem family which attached to IBM mainframes including the ES/9000 processor family. The 9345 DASD Model 1 has two 1.0 GB HDDs while the Model 2 has two 1.5 GB HDDs. For most practical applications, the 9340/9345 was functionally equivalent to a 3990/3390, although without non-volatile RAM cache of the 3990 and with a somewhat shorter maximum block length than the 3390. The OS's IOS component learned of this device's characteristics through a special initializer, IECCINIT, which also serviced other DASD device types, and for the same purpose. It was at initialization-time that the OS learned that the 9340 has no non-volatile cache and the 9345 has a shorter than expected track capacity. The initializer, therefore, assigned a different device type than the 3990/3390. 9331 Diskette Unit models 1 and 11 contained one 8-inch FDD while the models 2 and 12 contained one 5¼-inch FDD. 9332 Direct Access Storage Device used the IBM 0667 HDD. 9335 Direct Access Storage Subsystem This HDD used in this subsystem was developed under the code name "Kestrel" at IBM Hursley, UK, and was an 850 MB HDD using three 14-inch disks with dual rotary actuators, each actuator accessing three surfaces with two heads per surface. The HDD was in the rack mountable 9335 announced as a part of the October 1986 IBM 9370 Information System announcement. There is no known OEM version of this HDD. 9337 Disk Array Subsystem used the IBM 0662 (Spitfire) or 0663 (Corsair) HDDs. The IBM 2310 Removable Cartridge Drive was announced in 1964 with the IBM 1800, and then in 1965 with the IBM 1130; it likely first shipped with the 1130 in late 1965. It could store 512,000 16-bit words (1,024,000 bytes) on an IBM 2315 cartridge. A single 14-inch (360 mm) oxide-coated aluminum disk spun in a plastic shell with openings for the read/write arm and two heads. The 62GV first shipped in May 1974. Developed at IBM's Hursley, England, laboratory under the code name Gulliver with an initial capacity of 5MB. Subsequent models have 10 MB (62TM) and 14 MB capacities. It used a rotary actuator with one 14-inch disk. Rotary actuator technology was invented in Hursley as part of  the development of Gulliver. During its production life it shipped 177,000 units making it the first HDD known to have shipped in excess of 100,000 units. This section lists IBM manufactured HDDs offered both as an OEM product and for attachment to IBMs small systems such as the System/3, System/32, /34 & /36 and the AS/400. HDDs are identified by their OEM model number and listed chronologically by date of first customer shipment. The 0680 first shipped in 1979 on most IBM small systems and the low end of the System/370 as the 3310 direct access storage. The OEM version was announced as the 0680 in September 1981. Developed at IBM's Hursley, England, laboratory under the code name Piccolo with an initial capacity of up to 65MB, it used six 8-inch disks (210 mm). A double capacity version, the 62SW, shipped in June 1984 but very few units were sold because its price per megabyte was the same as the 62GV. The 0676 first shipped in November 1982 as a 5247 Disk Storage Unit for the IBM System/23 Datamaster. Developed at the IBM Rochester, MN, laboratory as the 21ED it was an 8-inch HDD with an initial capacity of 15 or 30 MB in 2 or 4 210 mm disks. In 1983 it shipped as the HDD in the 5360 System Unit of the S/36. In 1984 its capacity was doubled by doubling the number of tracks per surface and it was incorporated into the 5362 System Unit of the System/36. The 0667 first shipped in August 1986. Developed the IBM Rochester, MN, laboratory under the code name "Grant", it was a 70 MB ESDI full height 5¼-inch HDD with up to 4 130 mm disks. It was offered as a feature on certain models of the PC RT (6150, 6151, 6152) and in System/36 Model System Units (5363, 5364). The 0669 first shipped in 1987. Developed at IBM Rochester, MN, under the code name "Grant-Prime", it was a full-height 5½-inch HDD with a capacity of up to 115MB on up to 4 130 mm disks. It was the HDD internal to the System/36 5363 System Unit and Series 1 4956 System Unit. The 0671 first shipped in 1987. Developed under the code name "Lee" at IBM Rochester, MN, it was an up to 316 MB ESDI full height 5¼-inch HDD with up to 8 130 mm disks depending upon model. This was IBM's first usage of a thin metal film as the disk's recording surface. In 1988 it shipped as part of the 9404 System Unit of the IBM AS/400 system which contained two, or optionally three of these HDDs. The 0681 first shipped in April 1990. Developed at IBM's Hursley, UK, laboratory under the code name Redwing. It was an up to 857 MB full height 5¼-inch HDD using up to 12 130 mm disks. It was the first HDD to use PRML decoding of data. It was the drive component of the 9333 Disk Drive Subsystem which first shipped in early 1992. A higher density, 1.07 GB, version was incorporated into the 9333 subsystem in May 1992. The 0663 first shipped in late 1991. Developed under the code name "Corsair", it was a 3½-inch HDD with the height of a 5½-inch half-height device (1.6-inch high) and up to 1 GB on up to 8 95 mm disks. It was offered as a feature on certain models of the PS/2 and RS/6000. It was the first OEM disk drive to use MR Heads. The 0664 first shipped in November 1992. Developed under the code name "Allicat" at IBM Rochester, MN, it was a full-height 5½-inch HDD (3.25-inch high) that combined two 3½-inch devices in one, with up to 2.013 GB capacity on up to 8 95 mm disks. The 0662 first shipped in June 1993. Developed under the code name "Spitfire" at IBM Rochester, MN, it was a full-height (1-inch high) 3½-inch HDD with 1.05 GB on 3 disks or 5 disk surfaces. It was the HDD internal to the 9336 Disk Unit and the 9337 Disk Array. Another important IBM innovation is the floppy disk drive. IBM first introduced the 8-inch FDD in 1971 as a read only program load device. In 1973 IBM shipped its first read/write floppy disk drive as a part of the 3740 Data Entry System. IBM established early standards in 8" FDDs but never sold such products separately so that the industry then developed separate from IBM. IBM was at one point was the world's largest purchaser of OEM 5¼-inch FDDs; its selection of the two-sided, 48 tpi model helped establish the model as the de facto industry standard. IBM made extensive preparations to manufacture such models and smaller form factors but cancelled all such efforts in 1985. IBM's 1983 attempt to OEM its 4-inch DemiDisk failed. On October 17, 1994, IBM's Storage Systems division announced three new families of hard disk drives, the Travelstar 2½-inch family for notebooks, the Deskstar 3½-inch family for desktop applications and the Ultrastar 3½-inch family for high performance computer system applications. The following table compares IBM's first HDD, the RAMAC 350, with the last three models it manufactured in each of its "Star" series of OEM HDDs. It illustrates HDD's spectacular decline in cost and size along with corresponding improvement in capacity and performance. ^ The term DASD encompasses more than disk drives. ^ Note, however, that the I/O to the fixed-head area can be delayed by a seek in progress to one of the remaining cylinders; there is no equivalent to the multiple exposures of the 2305 fixed-head disk. ^ "HITACHI GLOBAL : News Releases from Headquarters : Jan 6, 2003". Hitachi.com. Retrieved 2011-07-20. ^ a b c d "Five decades of disk drive industry firsts". Disktrend.com (web.archive.org). Archived from the original on July 26, 2011. Retrieved 2012-10-15. ^ 1986 Disk/Trend Report — Flexible Disk Drives shows IBM production only of 8-inch FDDs and states, IBM will end internal production of 8-inch drives by 1987. ^ "CHM HDD Events: IBM 350 RAMAC". Archived from the original on 2010-01-29. Retrieved 2009-05-22. ^ "IBM Details Next Generation of Storage Innovation". 2006-09-06. Retrieved 2007-09-01. ^ Preimesberger, Chris (2006-09-08). "IBM Builds on 50 Years of Spinning Disk Storage". eWeek.com. Retrieved 2012-10-16. ^ Daniel, Eric; Mee, C. Denis (1999). Magnetic Recording: The First 100 Years. IEEE Press. p. 280. ... the scheduled ship date of the first field test machine slipped. In June 1956, however, the 305-A RAMAC went out to the Zellerbach Paper Company in San Francisco. ^ "IBM Board Cancels Disk File Project - Hard Disk Drives". Chmhdd.wikifoundry.com. Retrieved 2016-06-25. ^ "The IBM 350 RAMAC Disk File" (PDF). American Society of Mechanical Engineer. February 27, 1984. Archived from the original (PDF) on September 30, 2013. Retrieved April 4, 2014. ^ "Magnetic Disk Heritage Center". Web.mac.com. Archived from the original on 2010-12-20. Retrieved 2011-07-20. ^ "IBM Customer Engineering Manual of Instruction 1405 Disk Storage". IBM. 1962. Retrieved 2014-09-22. ^ "IBM 1301 disk storage unit - CHM Revolution". Computerhistory.org. Retrieved 2016-06-25. ^ "IBM Archives: IBM 2314 direct access storage facility". IBM. Retrieved 2011-07-20. ^ "IBM Archives: IBM 3340 direct access storage facility". IBM. Retrieved 2011-07-20. ^ Oral History Panel on IBM 3380 Disk Drive, Computer History Museum, January 3, 2006, p24. ^ IBM Corporation. "Direct Access Storage * 3.8GB, 4 actuators". Offering Information / Offering Catalog. Retrieved September 15, 2015. ^ "IBM Sawmill - CHM HDD Events". Chmhdd.wetpaint.com. Archived from the original on 2011-07-18. Retrieved 2011-07-20. ^ "9402-436 IBM AS/400 Advanced 36 Model 436". Dhart.no-ip.info. Retrieved 2011-07-20. ^ "IBM 9332 DASD startup and shutdown Video". Blingcheese.com. Archived from the original on 2011-09-18. Retrieved 2011-07-20. ^ "IBM Archives: IBM 1800 data acquisition and control system". IBM. 1964-11-30. Retrieved 2011-07-20. ^ "IBM 1130 Press Release". Ibm1130.net. 1965-02-11. Retrieved 2011-07-20. ^ a b c d "IBM Archives: Rochester chronology - page 4". IBM. Retrieved 2011-07-20. ^ "Reference Manual : 5362 System Unit" (PDF). Ed-thelen.org. Retrieved 2016-06-25. ^ "Old IBM hard drive power on". YouTube. 2010-06-26. Retrieved 2011-07-20. ^ "9404 IBM AS/400 System Unit Model CXX". Dhart.no-ip.info. Retrieved 2016-06-25. ^ "IBM SCSI Controllers and Disks" (PDF). Retrieved 2011-07-20. ^ InfoWorld - Google Books. 2002-11-18. Retrieved 2011-07-20. ^ "Word Pro - D180GXP_sp41.lwp" (PDF). Retrieved 2011-07-20. ^ Shim, Richard. "IBM plays "tag 'n seek" to speed desktops - CNET News". News.cnet.com. Retrieved 2011-07-20. ^ "IBM dusts off new laptop hard drives - Hardware - News". Zdnetasia.com. 2002-11-07. Retrieved 2011-07-20. ^ "Reference Manual : IBM RAMAC 305" (PDF). Ed-thelen.org. Retrieved 2016-06-25. ^ "CPI Inflation Calculator". Data.bls.gov. Retrieved 2016-06-25.